Our good friend Cam T is visiting us from Western Australia. We decided to wander the old, ruined Darulaman Palace together. The guards were initially reluctant, pointing out that we needed ‘a letter of permission’ to enter, though I am not sure who would issue such a pass. Perhaps they meant a different kind of letter. But with a little encouragement, the chief guard, who had a split lip and a loud voice, relented, though not before pointing out some areas where a little donation would help. I demurred. From within the ruined old palace, the new Parliament takes shape. We climbed a few internal staircases, somewhat hidden away, and there in a roof space was a pile of school books. It was odd. The fallen ceiling. It was quite beautiful, the way it hung, a lattice of plaster and wire. From an upper window. Clearly, someone had been hidden there, sniping at people below. Today we learnt that our bush property in the South West of WA has been largely burnt in the bush fires. My uncle’s house is destroyed; my parent’s home damaged. It is hard to be so far away, and the shock has an unreality to it. This entry was posted in original thinking, photos and tagged destruction, fire, kabul, palace by Phil. Bookmark the permalink. Beatiful pictures but sorry to hear about the fire.. I wondered about your folk’s place as soon as I heard where the fire was. #%$@!! The only bright side is no loss of life to my knowledge. Wish I was there with you and Cam! We had Breakfast Club in your absence while I was back in WA, great to be together with Hugh and Broady. I love the fact that you are writing a lot more frequently at present, always great to see and hear what’s happening. Sorry to hear about your family’s loss in the fire. Just found your blog after a suggestion from a friend. So sorry to hear the bush fires have destroyed so much – it must be hard to be so far away at this time and not be here with your extended family. I really liked this post – your photos are compelling and show a remnant of beauty in destruction. Beauty survives all. Just found your photos of Maimana when I was researching a rug I bought here in Fremantle, then was surprised to see you have a home in WA, then saddened to see you and your family have been devastated by the Margaret River fires. The gentle irony of your post on ruined but beautiful buildings then your own losses. My sympathies to you, your family and, no doubt, your friends and neighbours. 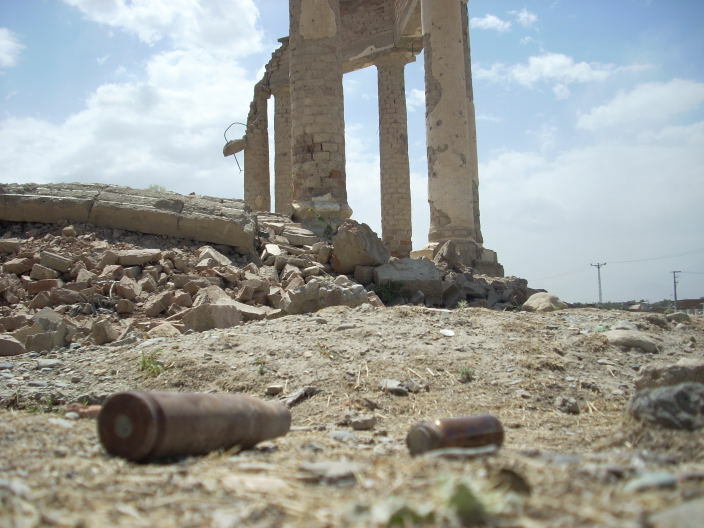 another dar ul aman (“place of peace”) photo – the once beautiful gardens, now sun-baked rubble, are strewn with shell casings in all sorts of calibres and old empty russian morphine ampoules. a bit macabre.